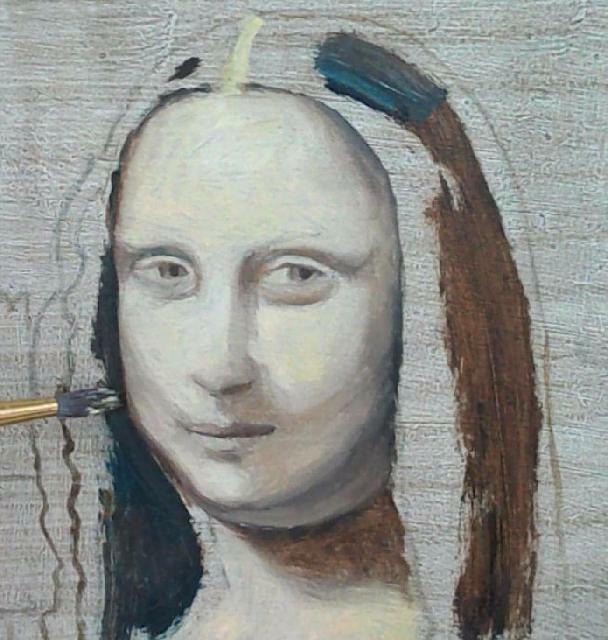 Oil Painting Medic: How Can I Paint the Mona Lisa in an Hour? How Can I Paint the Mona Lisa in an Hour? The painting the Mona Lisa by Leonardo Da Vinci is the most famous portrait in the world and one of the reasons might be the subtle and hard to define shadows around the face called sfumato. Sfumato is one of the painting modes of Renaissance art and is difficult to do. I decided to have a go at painting the Mona Lisa and post it on Youtube as speed art. But here are the common pitfalls of painting a face with a subtle expression. See my 2 Youtube clips on painting the Mona Lisa. The first glaze (above) was completed in around twenty-five minutes. Once the first glaze was touch-dry, I began on the 2nd glaze (below) which took a further half-an-hour. The second process enabled me to elaborate on shadows and refine shading. Both processes have been speeded up, so that viewing time has been compacted to a few minutes. 1 Expressing shadows on the face as just that: shadows. This might cause the artist to reach for black or very dark brown and treating them as a separate entity to the rest of the face. This might result in dirty-looking patches around the forehead, nose and chin. 2 Making assumptions about the face without actually looking at the visual resource. The Mona Lisa does not have visible eyebrows for instance. There are also no definable lines around the eyes or nose. Only a subtle line can be seen on the seam of the lips. A temptation to express lines where none exist might ruin the sfumato effects sought after. 3 Not noticing the slight differences in tones on the face. One tone might be slightly lighter, darker, warmer or cooler than another, yet omitting to notice these differences could result in a flat face with features that appear disembodied. As can be seen in the Mona Lisa, there are a soupcon of shadows around the brow, cheekbones and chin. Standing back from the painting will make these shadows more apparent. 4 Using poor art materials. Top quality fine sables are essential for expressing the fine detail around the eyes and mouth. Fine sables also hold less paint than a wide brush, which is ideal for sketching delicate shadows around the cheekbones and brow. A wide brush would fail to offer the artist sufficient control over the paint for these subtle areas. Similarly, using a fine sable is ideal for shading the painting in a similar fashion to a drawing. The most difficult part of the painting is undoubtedly the shadow areas around the face. Edges are implied rather than stated, which means there are no or little outlines to be seen anywhere on the portrait, except perhaps around the hairline. Da Vinci expressed shadows around the forehead, eyes and nose. Yet from afar, these subtle areas come together to portray a face that appears neither to smile nor frown, but look upon the viewer knowingly. The slightest misplacement of shadow or highlight will give the face an entirely different expression, which could become a smirk or a grin. I began by sketching the portrait lightly in pencil before overlaying the drawing with acrylic paint. I then overlaid the lines with two translucent coats of burnt umber acrylic paint. This made the highlight areas easy to see on application. I used a limited palette of burnt umber, cadmium yellow, burnt sienna, pthalo blue and white. I mixed a little cadmium yellow and burnt sienna into mostly white for the highlights and with a separate sable, mixed cool highlights and darks, which consisted of burnt umber and white. The trickiest part was expressing the shadows around the face, such as the hollows around the eyes, getting the angle of the nose right and portraying the slight dimples around the mouth. Once I had completed these areas, I felt I could relax more in sketching in the landscape around the figure. This area comprised mostly pthalo blue, burnt umber and white. Painting the Mona Lisa is undoubtedly a challenge for the artist. The key is high visual awareness of shadows around the face, regardless of how subtle. Sfumato is the implication of the outlines without any actually being seen. In the Mona Lisa, there is no clear boundary between hair and cheekbones. Resist the temptation of expressing lines where none can actually be seen. I have recently released a more indepth guide on how to paint this masterpiece and attaining sfumato effects. It is included in my other book: Skin Tones in Oil Color: 10 Step by Step Guides from Old Masters. This demo turned out so lengthy, decided to create a mini ebook on this project. Both books are available from Amazon. I just ordered the book. Can't wait to learn the technique! Good luck on your project! I hope my book will prove helpful. Patience and time are also key.